From long-term, permanent employment to contract positions, there are many choices out there for IT and technology professionals. In my role as a tech recruiter, I talk to IT pros every day about the various employment options out there. While years ago, most people mainly sought permanent opportunities with specific benefits like healthcare and retirement matches, the employment landscape has changed drastically. For some, it’s about seeking more and better tech skills that will challenge them and propel their careers to new heights. For others, it’s about working on that awesome new project they heard about. And then some tech pros care most about being a part of a cool company culture with perks like on-site gyms and coffee lounges. And while tech professionals have shifted their priorities, so have businesses large and small. Companies require efficient, effective solutions for scaling quickly, especially those that have prioritized agile business practices. The organizations must have access to a pool of talent that possesses the appropriate skills to meet demanding project requirements. With that said, companies have adjusted their hiring strategies to include consulting roles and positions that may have never existed previously. With all of these options and priorities, then, how can you decide what kind of employment opportunities are right for you? First and foremost, you should stay true to your personal and professional goals and you must understand the various employment situations that are available to help you meet those objectives. Contract: A role for which there are specified terms that could include duration of project, specific benefits, etc. For contract positions, there may be health benefits and/or 401K, as well as a company match. But typically, there is no sick time or holiday/vacation pay. Certain states, however, may require employers to provide a certain amount of accrued sick time. Consulting: Typically, another term for a role that is governed by a contractual agreement. Temp work: As the name suggests, these roles are always temporary and usually imply shorter-term projects. Straight contract: We often hear this term used to refer to a role that is strictly contract-based and will not end up turning into a permanent position. That said, you never know what could happen. Some positions that start off as straight contract end up as longer term or even permanent roles if the employer really likes the consultant. Contract to perm: In this case, employers are seeking to hire someone as a contractor to start with the intention of making the position permanent at some point. There is a budget in place for the role and the employer wants someone who will transition to the permanent position. Each of these situations offers unique benefits and potential drawbacks depending upon your unique goals. In the tech world, it can be quite tempting to go with the highest paid position. But, again, you want to remain true to your personal and professional goals which means that you need to look at the bigger picture and not just financial compensation. What rates are you used to receiving? If you were working in a permanent position previously, what was your base salary? What was the best annual W2 that you have had? While it is quite common to negotiate the proposed rate on a consulting offer, there is sometimes a cap. And you obviously need to factor in the commuting situation, benefits, as well as sick time, vacation and holidays. When all is said and done, only you can decide what your rate needs to be given your budget and personal situation. One of the things that’s very tricky when seeking a new employment opportunity is the ability for candidates to truly understand the underlying company goals and culture that accompany a consulting opportunity. This is truly one of the most valuable and powerful benefits of engaging with an effective recruiter; if he/she is good at what they do, they will take the time to match your needs with the right companies and positions, enabling you to get where you want to be. How does the company treat its consultants? Are they integrated and part of the company? Or are they treated distinctly from other employees? And how do you feel about that? How do consultants fit into their business model and do they have a history of converting consultants to permanent employment? Clearly, there are a lot of things to think about when evaluating potential job opportunities. By evaluating the types of roles available and matching these up to your personal and professional objectives, you can begin to narrow in on roles that are the best fit. And don’t forget to consider company culture as you sift through your options; while it may not be the deciding factor in your decision, it might certainly help you when evaluating several offers. 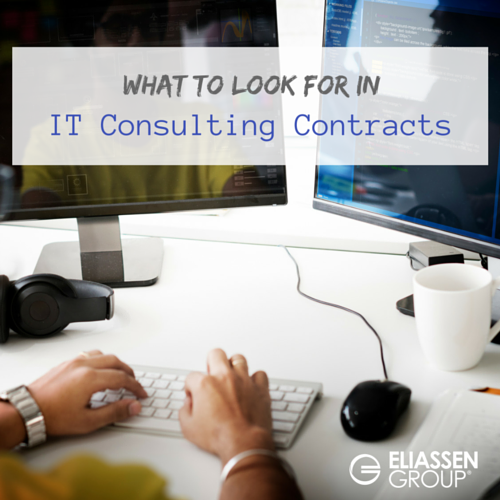 Are you considering a new IT or tech role and trying to make a shift to consulting? We are happy to answer any questions you may have: solutions@eliassen.com.